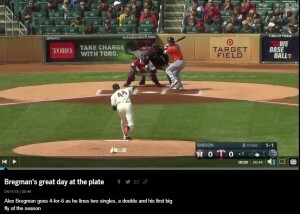 Alex Bregman had his breakout game of the young season, going 4-for-6 with a double, home run, and an RBI (see video below), but the Houston Astros (9-4) nevertheless lost to the host Minnesota Twins, 9-8. 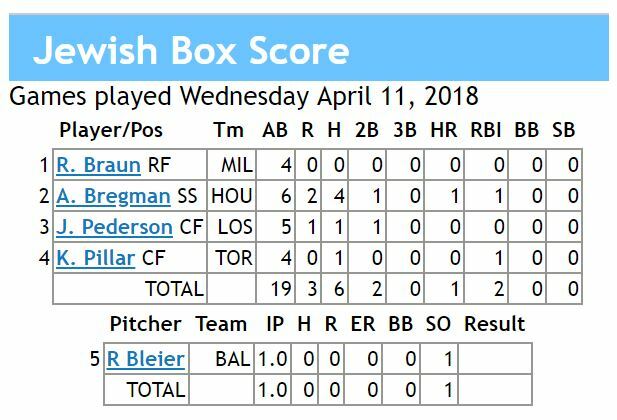 Richard Bleier earned his second hold of the season with one shutout inning as the Baltimore Orioles (5-8) held off the visiting Toronto Blue Jays (8-5), 5-3. 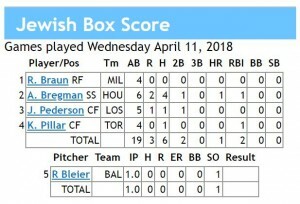 Bleier’s performance lowered his ERA below the 1.00 threshold. Danny Valencia did not appear for the O’s. Toronto’s Kevin Pillar was 1-for-4 with a two-out RBI. Joc Pederson started in left and batted second, doubling once in five at-bats and scoring a run as the LA Dodgers were crushed by the host Oakland A’s, 16-6. Ryan Braun was 0-for-4 with a strikeout as the Milwaukee Brewers (7-6) held off a late rally by the host St. Louis Cardinals for a 3-2 win. Just five runs short of 1,000 RBIs, Braun has driven in more runs since his 2007 debut than all but five other players (see article). Ryan Sherriff is on the disabled list for the Cardinals (5-7). The LA Angels (10-3) beat the host Texas Rangers, 7-2. Ian Kinsler is expected to return to action tonight from the disabled list as the Halos visit the Kansas City Royals. Gabe Kapler‘s Philadelphia Phillies (6-5) beat the visiting Cincinnati Reds in 12 innings, 4-3. Maybe I’m just paying attention because Kapler’s a MOT, but I don’t remember any rookie manager getting so much attention for such strange things, not to mention the kerfuffle over him pulling starter Aaron Nola on Opening Day.